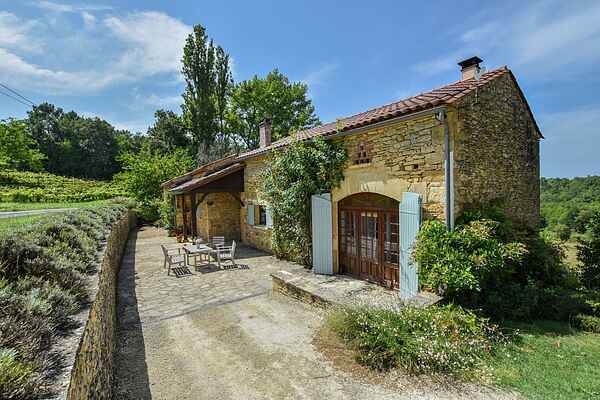 This traditional Périgord house is perfect for a peaceful, sunny holiday. You will have a choice of enjoying the private swimming pool and visiting the area stuffed with tourist sites. Built in 1889, the house was completely and tastefully renovated by its owners, who took care to preserve its authenticity by keeping its ochre stones that are typical of the region. The owners live in one part of the house but have completely partitioned the other half for your privacy. On the partially covered terrace you can enjoy a sitting room area with a splendid view over the surrounding meadows and woods. The veranda has been completely closed to create a warm sitting room area for cold evenings. In front of the house a second terrace awaits for your breakfasts in the morning sun. Do you need a massage? The owner of the house, a professional masseur, offers tariffed services on request. 30 metres from the house, your nearest neighbours are two adorable donkeys belonging to the owner, who will become your best friends if you give them some apples from the garden. A stone's throw away you will find the fortified town of Villefranche-du-Périgord. (1,5km.). For your lovely walks there are some woods 50m away. You are also near the famous castles of the Dordogne valley such as Biron (25km), Castelnaud la Chapelle (30km), les Milandes (35km), or even Beynac and Cazenac (43km).